Hammers are a basic tool for every home. Homeowners and construction workers alike should own one, if not more, depending on the type of projects they undertake. Most everyone has reason to own a good quality hammer. Good quality is important in a hammer because you want it to be made of sturdy, long-lasting materials that will stand the test of time. Our top pick, the Maxcraft 8-oz. Stubby Claw Hammer, provides users with a strong, sturdy hammer that has a non-slip grip and full-sized, forged-steel claw head. It is a hammer that you will find yourself wanting to use again and again; a great example of the type of high-quality hammer you want to have in your home or shop. There are many types of hammers on the market, each used for handling different jobs. We’ll go over the different types below in our buyer’s guide. It doesn’t matter if you are pulling nails out of boards, building a DIY project or constructing a house, a hammer is considered a tool box staple. It is beneficial to any homeowner, DIYer or professional to have several types of hammers on hand for different tasks. The right hammer will make certain jobs go more smoothly. In order to choose the right hammer for the job, you will need to have a good idea of the jobs and projects you will be doing. This will help you determine what type of hammer or hammers are best suited for your tool box. A hammer is one of the oldest and most-used tools out there. With so many different types, handle materials and lengths available, choosing one can feel a little overwhelming. After reading this guide you will understand what you need to know to choose the perfect hammer for your needs. This one pound, rip claw hammer is created from one solid piece of fully polish steel. The shock reduction grip is molded and bonded to not come off and will reduce shock during use up to 70%. The UV coating is an attractive blue that stands out in your tool box for easy identification. This hammer is designed to rip nails and is the perfect hammer for light to medium use. The Estwing company has been making exceptional tools since 1923. With proper care, this hammer is one that you will use for decades. It is perfect for driving and removing all types of nails. It measures 13” in length and has a good weight to it that feels good in your hand. This is one hammer you want in your tool box to take care of all your striking and prying needs. There are many features that the Stanley FatMax Xtreme Hammer has that makes it a must have for your tool box. These features include a torsion control grip and anti-vibe technology that will reduce impact shock and minimize vibration. Its one-piece construction from solid steel provides plenty of strength and durability. The torsion control grip technology is patented and reduces the strain that torque can have on the user’s elbows and wrists. This hammer feels great in your hand during use and makes quick work of any striking and nail-pulling jobs you have. If you’re looking for a great-quality, long-lasting hammer to add to your tool box, Stanley’s FatMax Xtreme is the way to go. This quality hammer comes with a limited lifetime warranty. The stubby handle on this sturdy claw hammer makes it a great choice for most projects, especially if you don’t have a lot of room to work. The hammer weighs about 8 ounces and features a claw head made of forged steel. The handle is covered in soft, non-slip material that is contoured for easy gripping. It also features a magnetic head that holds nails in place which makes starting them super easy and able to be done one handed. This sharp looking hammer has a yellow and black handle that is easy to hold, even if your hands are sweaty. The bright color makes this tool easy to find in your tool box. It is perfect for removing nails, hammering nails into place and various other hammering tasks where a good-quality, sturdy hammer is needed. With all their possible uses, owning several types of hammers will help you complete a variety of tasks and projects around your house and in your workshop. Hammers are also commonly used in commercial applications. Purchasing good quality hammers is important. There are sturdy, long-lasting models available like the three we reviewed above and there are lesser quality hammers as well. It is important to identify good quality tools from the ones you don’t want in your tool box so you don’t waste your money. This buyer’s guide will help steer you in the right direction as you sort through different types of hammers. We can help you determine which are high quality tools and which aren’t so you will have an easier time making your decision. There are several parts that make up a hammer. Knowing these parts can help you understand the different types of hammers and what each part plays in a quality tool. We have listed all the different parts of the hammer below. Claw – On one side of the head the claw curves downward and is split down the middle. The split forms a V shape that works well pulling nails from wood, drywall, and other materials. This claw is found on hammers that are designed for nailing and pulling. Face – The face of the hammer is a flat or curved surface that is on the top of the head. The face can be used for making direct contact with objects or surfaces such as nails, drywall, and metal. These surfaces can be either textured or smooth. Some models of hammer can have a face on both sides of the head yet some have it on only one side. Another difference is either a flat or curved face. Some, such as a hammer with a milled face, have raised criss-cross grooves. If it is a smooth-faced hammer there will be no grooves. Mallet-style hammers have two faces, one on each side and no claw. Some hammers have a claw on one side or a hatchet or ball. The style of hammer determines the design of the head. Cheek – The cheeks of the hammer are the sides of the head, these frame the face of the hammer. Eye – There is a hole on the top of the head in the center. This is known as the eye of the hammer. The eye ensures that secure attachment of the head to the handle. The higher quality hammers have a tapered eye. Head – The entire top part of the hammer is called the head. It can be made of rubber, titanium, or forged steel. The weight of the head varies from hammer to hammer and will be determined by the material it’s made of as well as its size. Depending on the hammer, the head can weigh several pounds or as little as a few ounces. Handle – Hammers have many different types of handles. The handle is the section that the user holds. It is connected to the head of the hammer and can vary in length from very long (as is the case with a sledgehammer), to very short like the Stanley Hammer we reviewed above. Long handles offer less control over where the head lands and are usually better suited to demolition. Hammers are made from many different types of materials. The quality of the hammer is determined by the type of material that is used to make the head and the handle. These factors also determine how well the hammer performs and how easy it is to use. Handle – The most common material used for traditional style handles is wood. The problem with wood handles is that they can split or wear down over time, losing their glossy finish and sometimes splinter. Most modern hammers have a rubber or nylon grip over steel. 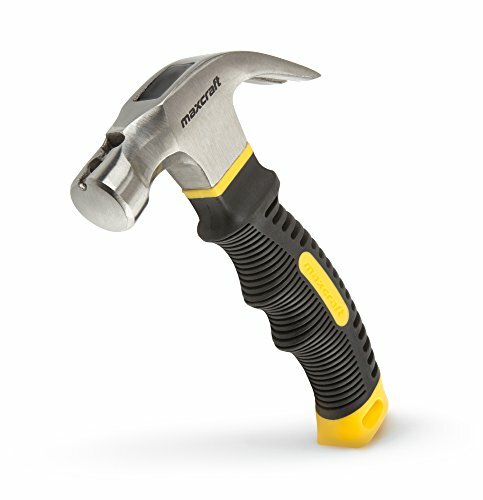 This grip makes the hammer much more comfortable to use and cushions the vibration during use. Head – Most hammer heads are made from either steel or titanium. Titanium heads are more expensive yet they are lighter and somewhat easier to use. They tend to swing faster and have less vibration sent to the user. Mallet hammer heads are usually made from hard rubber although they can be made from wood or brass. There are many different hammers on the market that can be used for a multitude of tasks. We have listed the most common types of hammers below along with their most common uses. 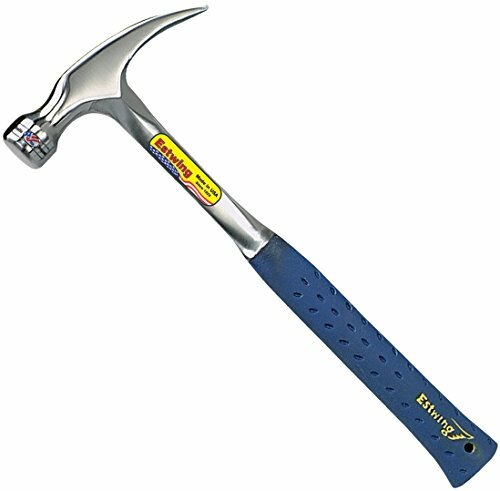 Tack hammer – this lightweight hammer usually has a magnetized face on one side that helps hold small tacks and nails so it is easier to start them. Tack hammers are most often used for upholstery work and furniture making. Finish Hammer – This lightweight hammer has a smooth face which prevents you from damaging and marring the surface of the material into which you are hammering. They are most often used to drive finish nails and tacks used onto trim and for small wooden projects. Most finish hammers weigh from 10-14 ounces. Nail Hammer – This is the most common of all the hammers. They look like finish hammers but weigh a bit more – from 14 to 20 ounces. The face of the nailing hammer is usually smooth. This type of hammer is most often used for pulling nails out of wood and other surfaces, and is good for driving nails as well. Framing Hammer – The head of a framing hammer is heavy and the handle is longer than on other types of hammers. This maximizes the power the hammer can put out for driving nails. The face of a framing hammer is usually waffled or textured in some way. This provides much better contact between the face of the hammer and the head of the nail. Framing hammers usually weigh 18 to 28 ounces. Titanium framing hammers are a good choice because the exert the same amount of force but are lighter in weight. Ball Peen Hammer – Ball Peen hammers are good for heavy jobs that involve driving out pins or setting rivets. These hammers have a rounded ball on one end and a flat peen on the other for hammering. Ball Peen hammers can weigh 6 ounces to as much as 30 ounces depending on what job they’re performing. Mallets – Mallet hammers can have hard-rubber, wood, metal, or hard-plastic heads and they have long handles. Mallets can vary in length and are good choices for demolition work, such as the kind required in remodeling jobs. Sledgehammer – These heavy duty hammers have a heavy head that is attached to a long handle. This type of hammer can apply stronger force than any other hammer due to its weight and size. Most sledgehammers are meant to be swung with two hands. One of the biggest factors to think about when purchasing the proper hammer is the job you will do with it. Most workshops or home garages have more than one type of hammer so be sure to know the jobs you’ll most often engage in when looking for a new hammer for your tool box. With all the available choices, it is possible to get a hammer for every different project you might have. You want to ensure that you choose a hammer that is high-quality, long-lasting, and durable. Look for models that are one, solid piece of steel with a good-quality, cushioned handle to minimize shock. The brand name is also something to consider as name brands which have been around awhile are often the best quality. With the information in this buyer’s guide, you will be able to choose the right hammer for your needs and can be confident that it will last you a long time. Maybe even a lifetime!